Treatment of DNA with bisulfite converts cytosine residues to uracil, but leaves 5-methylcytosine residues unaffected. Thus, bisulphite treatment introduces specific changes in the DNA sequence that depend on the methylation status of individual cytosine residues, yielding single- nucleotide resolution information about the methylation status of a segment of DNA. 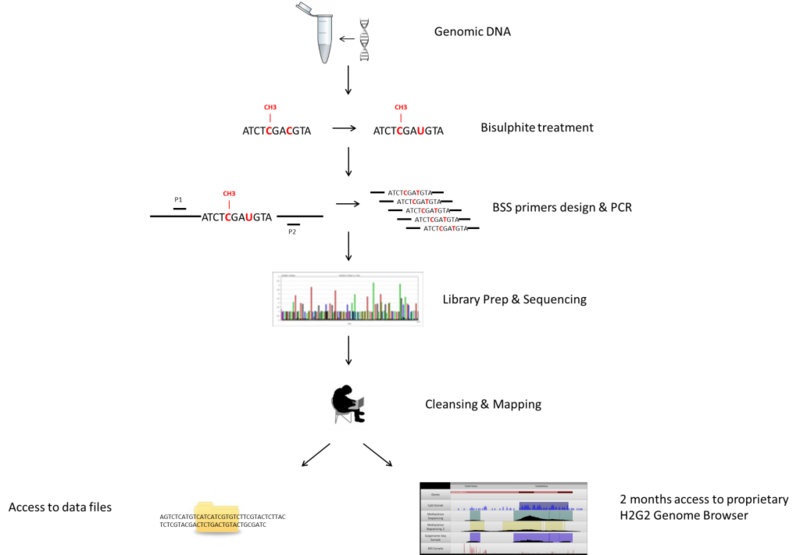 After sequencing of bisulfite treated DNA and comparison of the reads to the reference genome, single-nucleotide methylation levels can be established. Our (Oxidative) Bisulfite Sequencing services can be used for targeted, genome-wide and whole genome discovery or for validation of already discovered differential methylation using other techniques. First of all your samples are bisulfite-treated. After designing PCR primers for the regions of interest, the PCRs are performed. Before the sequencing can be performed the PCR products will be normalized and pooled with a focus on an optimized sequencing run. Then the library prep and sequencing are performed. After the sequencing the resulting data will be cleansed and mapped. Customers will get their raw data on a hard disk and will get access to our H2G2 genome browser. This software allows for easy analysis after completion of the experiment.